Is that already the market for fuel cell heating systems which everyone has worked toward for so long? No, not quite, because the Technology Rollout Program (TEP) has not yet come into force. And as long as neither manufacturers nor customers have some kind of planning security, nothing will happen. That much became clear during the SHK Essen in Germany. But TEP could apparently become a reality this summer, prompting several manufacturers of heating systems to announce their market entry for the fourth quarter. Initially, it was said that TEP would start in January – later, it was postponed to May. 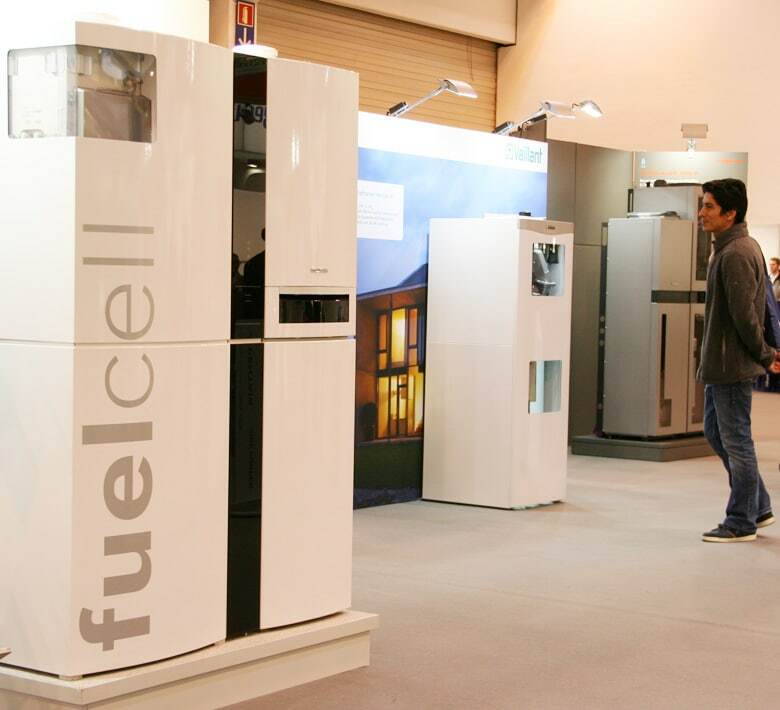 At least at the end of this year, we may actually have a full-fledged market for fuel cells in the heating segment. Almost all big manufacturers of heating systems presented their current fuel cell system generations on the Trade Show for Sanitary Facilities, Heating, Climate Protection and Renewable Energies in Essen, Germany. Most of them intend to share in the technology’s advancements despite their rather cautious approach to the market so far. But none of them can afford to stay on the sidelines here. 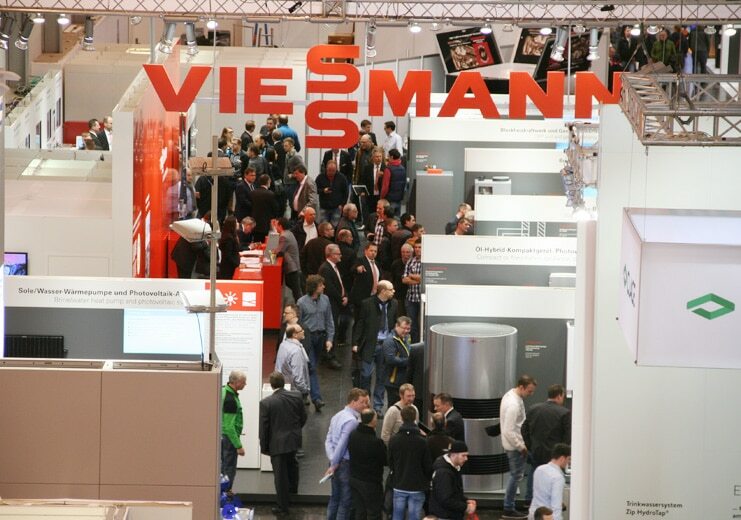 Whereas big players, such as Vaillant, Viessmann or Junkers, have already made fuel cell systems part of their product portfolio, others (e.g., Brötje) made no efforts to exhibit anything alike at their booth. Even Vaillant and the others had nothing truly new to show attendees – at least, nothing related to fuel cells. Only Buderus presented the concept study of its next system generation scheduled for 2018 (to quote a trade show visitor: “Oh man…that looks truly awesome!”). All others showcased systems of which the public had already been long aware from extensive field tests. Especially at the big-size booths, the main target group were the installers. Everywhere you could see throngs of sales representatives praising the feature highlights of their heating systems, with industry professionals trailing behind them. At Vaillant’s exhibit, an eloquent sales professional tried his best to extol the virtues of xellPOWER in front of a group of building service technicians. They, however, seemed quite hesitant at first in light of the technology’s novelty status and the high price, but were interested nonetheless. However, they didn’t seem to be quite ready yet to believe that “this device will succeed ecoPOWER 1.0,” as the sales rep announced. The xellPOWER manufacturer based in Remscheid, Germany, sees the main use for its device in the refurbishment of existing building stock, where the high-temperature unit and its SOFC stack can guarantee high flow temperatures and long-term reliability during what should be uninterrupted operation. “The fuel cell unit cannot be started more than 200 times. Afterward, it’s finished. That means 20 restarts per year,” one of the company’s employees explained. Mass production is scheduled for the fourth quarter this year, meaning for December 2016. The system will be priced at around EUR 30,000. Vaillant expects that everyone owning such a system can receive EUR 10,000 in grants, so that he or she would be left with paying the other EUR 20,000. Viessmann has meanwhile put its second generation out on the market: It’s year two after the introduction of Vitovalor 300-P. The German and EU programs for demonstration systems, respectively callux and ene.field, have resulted in several dozen systems in trial runs, although the contingent of ene.field is exhausted, so that “regular” sales are now being pushed to the forefront. The company based in Allendorf, Germany, shows the list price of its system to be around EUR 20,000 (incl. VAT). At the very end of hall 3 in the left-hand corner was the booth of elcore, which has been offering a commercially available product for about the same price as Vaillant since 2015. Elcore was at the SHK to try and get into contact with other companies and establish its own distribution network. Without a big parent company to back the organization, the Bavarian enterprise will have to rely entirely on cooperation partners to be able to bring its modules to the boiler rooms of potential customers. The team of Manfred Stefener, however, seemed confident and motivated enough to accomplish such a feat. Over one hundred units had already been in operation, elcore said. And the staff increase to now 80 employees proves that the investors behind the endeavor continue to share the team’s belief in the success of the business. 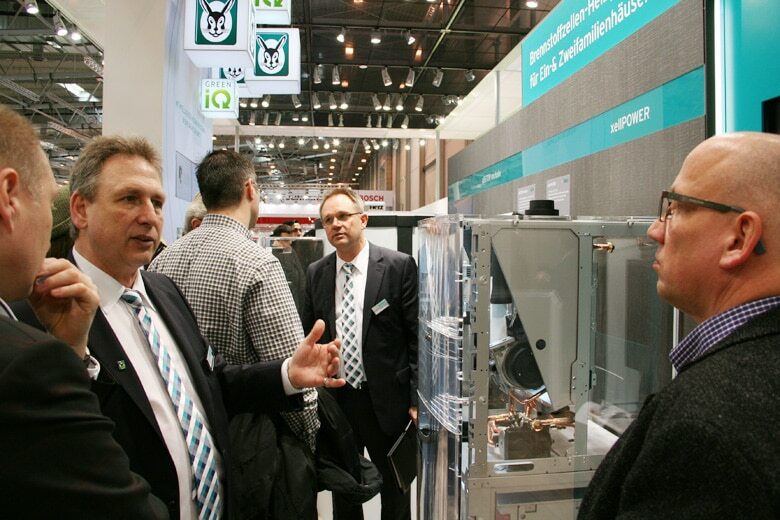 The rear right-hand corner of hall 3 was occupied by the small booth (40 m2) of SenerTec. The company best known for its Dachs – and celebrating its 30th anniversary this year – is said to greet the market with a fuel cell module originally developed by Baxi Innotech. At the request of BDR Group, the business‘s 150 employees and around 1,000 partner companies set out to achieve market readiness with the module. The Dachs InnoGen system, which used to be called Gamma Premio and now houses a fuel cell unit by Toshiba, is thought to be available at the end of the year for around the same price as the ones by elcore and Vaillant. SOLIDpower was indeed present at the trade show, but only as one of the exhibitors at a joint booth of the EnergyAgency.NRW. The BlueGen unit showcased there is planned for commercialization from 2017 onward (priced at around EUR 25,000 minus about EUR 12,000 in grants). Until then, the ene.field program will have more systems to show for. So far, the company has installed 670 of these systems around the globe, about half of them in Germany. Contrarily, Remeha and Brötje did not display anything fuel cell-related, and the GC Group, which Brötje has been part of since 1999, had hardly anything to say about it too. The Fuel Cell Cluster OWL, which was said to have been founded at the end of 2014 by Karl Brand Haustechnik, was nowhere to be seen. Additionally, the 50th anniversary of the SHK Essen came with a widely announced special presentation of fuel cells, which was pretty disappointing after all. Hall 2 had only three fuel cell heating systems between the meeting point for trainees and the booth of the professional association of the trade: Vitovalor 300-P by Viessmann, xellPOWER by Vaillant as well as Logapower FC10 by Buderus, although the last one will be commercially available only from July 2016 on, as will be CeraPower by sister company Junkers. Except one company employee, there was no staff present to answer any questions. 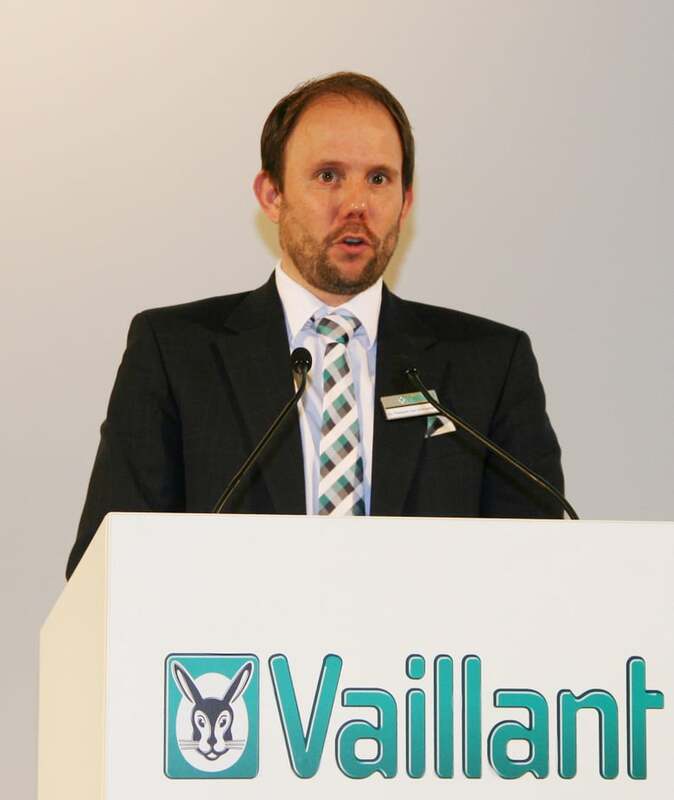 As one few companies, Vaillant organized a press conference in Essen. There, Tillmann von Schroeter, who took over management of Vaillant Deutschland one year ago from Andree Groos, explained: “We’ve achieved market readiness and will begin deployment in fall. The fuel cell is a very popular and very efficient technology.” As proof, he pointed to the fast-paced sale of the 150 test units in operation. Overall, Vaillant has tested 250 modules through callux and ene.field. He added: “In the pilot stage, an amount short of EUR 20,000 is an attractive end customer price – including grants, of course. Our aim is not to incur any losses by selling.” Furthermore, Vaillant expects to market “a three-digit figure” of units within the first 18 months after deployment. The manufacturer of heating systems views the introduction of the efficiency labels as an important instrument to heighten interest in new technologies. They have already been a must for new systems, but from 2017 on, they will also be required for heating modules older than 15 years (70% of all heating systems, according to the German Federal Ministry for Economic Affairs), so that building owners become aware of old and often inefficient systems. Alexander Dauensteiner, spokesperson of the Fuel Cell Initiative (IBZ) and a Vaillant employee, said: “The efficiency labels will offer transparency to anyone who intends to modernize their heating system in the boiler room, and it will be a help in deciding on a new heating unit.” All fuel cell heating systems have an energy rating of A++. Subsidies have been available through the Federal Office for Economic Affairs and Export Control (BAFA). As an especially energy-efficient and forward-looking technology, fuel cell heating systems enjoy an investment grant of altogether EUR 3,515. Additionally, the CHP Act offers 8 cents for each kilowatt-hour fed into the public grid and 4 cents for each kilowatt-hour of self-consumption.